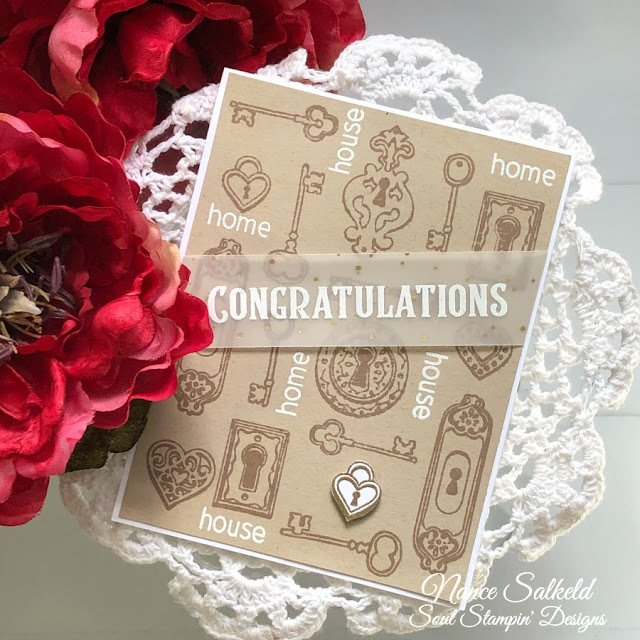 I have been invited by Catherine Pooler to be a Guest Designer for the upcoming Stamp of Approval Collection, Adoring You, available tomorrow, January 9th in the Catherine Pooler Designs Shop. If you aren't familiar with Stamp of Approval, it's a quarterly collection of themed stamps, dies, sometimes other goodies coordinated to go together and to help create beautiful cards or projects. Each collection is exclusive and there is a limited number for sale. Once it's sold out the products aren't available again until maybe months later. The Adoring You Collection goes on sale tomorrow - January 9th! You can go to Catherine's site, here, for more details. 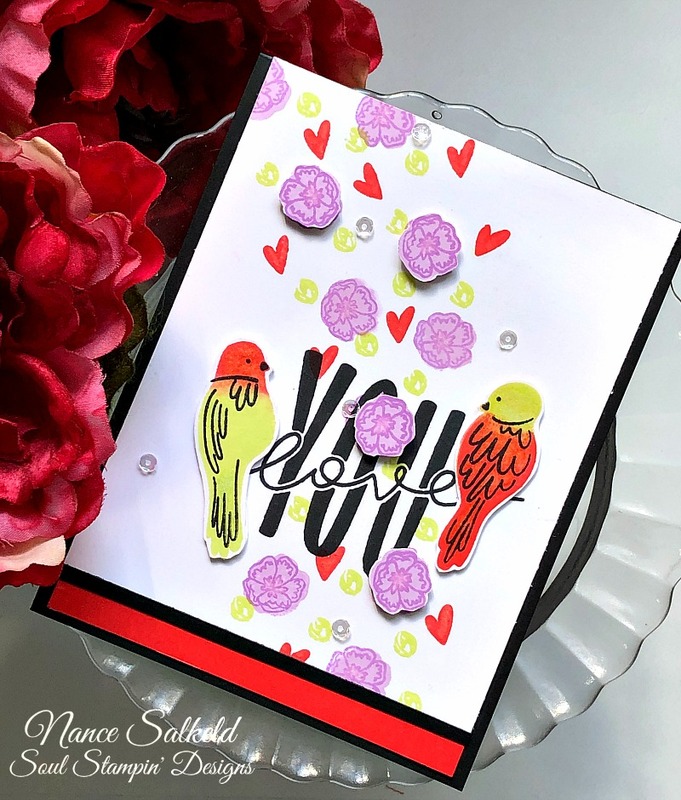 I'm so thrilled to share with you some of the cards I have made with the some of the stamps sets from Adoring You. My first card uses the stamp set, The Key. I started my card off by lightly tracing a heart on white cardstock using a basic heart die. Then, using my Misti, I set the stamps around the left side of the heart. I gently "bent" a couple of them to conform to the heart shape. This is easily done using the Misti or an acrylic block. I set them up on the left side of the heart, prepped to stamp with Versamark and embossed in gold embossing powder. I repeated the process on the right side. Once that was done I colored in the heart and little areas in each key for a little pop of color, using a red Copic marker. I kept the rest of the card simple, just adding two tiny strips of black cardstock at the bottom and setting the whole thing on a black cardbase. My next card that I created I used The Key set again along with the Congratulations set. The Congratulations set comes with a lot of great sentiments to use for any kind of celebration whether it's new home, new job, new baby, whatever, all in one set with several different lettered "congratulations" words as well. I created a background using the keys and locks from The Key and then added in some of the words from the Congratulations set to create a "new home" card. I white embossed the Congratulations sentiment on some gold flecked vellum to lay across the top of the card. My last card I did a lot of stamping again using the Happy Together Stamp set. Those birds are just too "adoring"! I started stamping them until I now have my own paper bird aviary in every color you can imagine! LOL . I used some of the flower stamps and little heart from the set to create a cascading floral/heart shower falling through the sentiment, Love You, which is also in the set. Stamps: The Key, Congratulations, Happy Together (Adoring You Stamp of Approval Collection). Ink: Versamark, Midnight, Sand Castle, Samba, Melon Ice, Sweet Sixteen, Pixie Dust. Cadmium Red Copic marker. Extras: White embossing powder (WOW); Gold Fine Embossing Powder (WOW); Glimmer pen (Nuvo); clear sequins. Wow! This is exciting news, Nance! 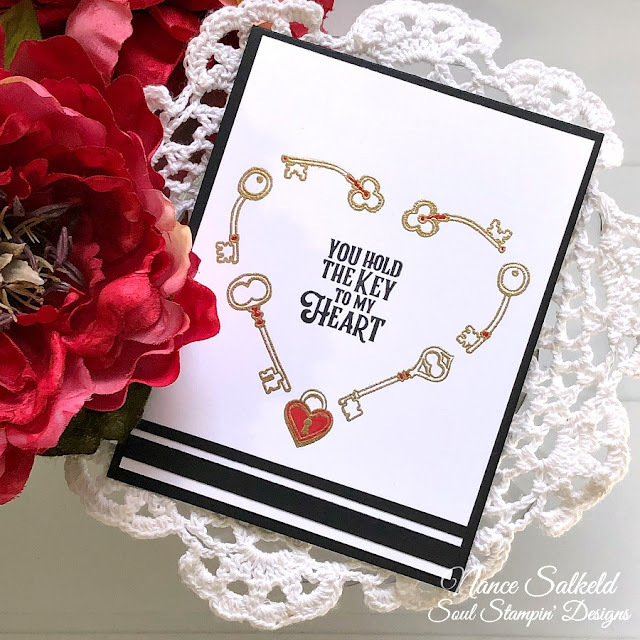 I love the heart you made from the key and the new house card! Your birds are so bright and pretty! Sounds like we'll be seeing more of them. Congratulations on being asked to be GD!